A black and white large format negative of Mr. and Mrs. Fusco on their wedding day, November 28, 1946. In this view they are cutting their wedding cake. 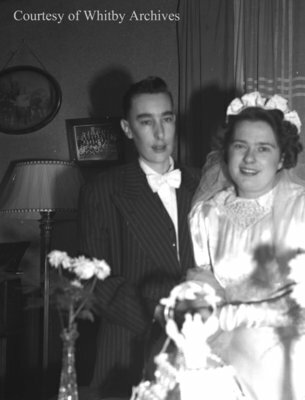 Fusco Wedding, November 28, 1946, Marjorie Ruddy. Whitby Archives A2013_040_539.